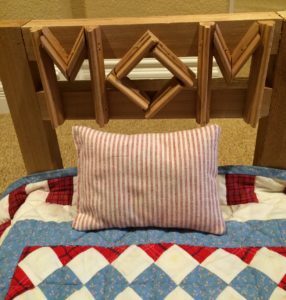 It’s almost Mother’s Day and I wanted to share some little Doll Quilt Beds made by my son Karl. 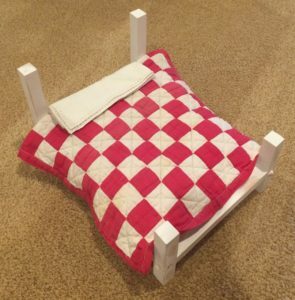 He knows I collect antique doll beds, American Girl doll beds and others (I think I have over 30 now) so I decided to share a few of his hand made beds with you. Next blog I will share some of the antique beds and their quilts, from my collection. This first one he made for Mother’s Day. I wish he had dated it but I think it was around 8-10 years ago. As you can see in the close up he cut little pieces of wood to spell “MOM” on the headboard. I just love it. 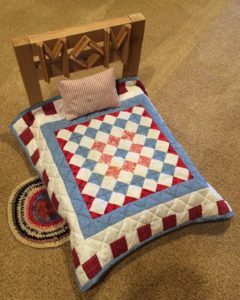 The next one he made because I wanted a special bed to hold this little red and white quilt. My mom is 93 and this doll quilt was made for her when she was 5 years old. My grandma was so proud to machine quilt it on her treadle machine. Personally, I would have liked it hand quilted, but she was trying something new for her. Mom used it to cover her doll and I feel fortunate to have it. 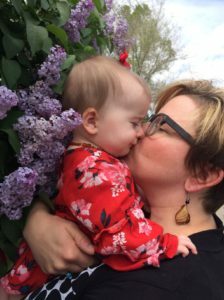 Since it is nearly Mother’s Day I also wanted to share an updated picture of my daughter Lisa with my 7-month-old granddaughter Freya! We all love lilacs in springtime and it was so nice on our walk to stop and smell these. Fresh flowers are almost as good as doll quilts! If you are lucky enough to be a mom and/or grandma I hope you get to spend some time with them next Sunday. ← I is for Island Vacation – at Wooden Spools!